If you own or manage a business, it’s impossible to underestimate the value of advertising; this is especially true if you have just started out or have only limited access to your target market. One meaningful way to find new customers is to make your name visible to the world, and products such as our branded beanbags can do it. When we screen print your logo on them, our bean bags can create visual impact and increase brand awareness in almost any situation while making your guests comfortable and happy. At Bean Bags R Us, we pride ourselves in being corporate Australia’s number one resource for top-quality branded beanbags. Whether they’re providing extra seating at indoor conferences or outdoor cinemas, our durable, blissfully comfortable bean bag chairs and lounges are always a hit with potential clients and patrons. After all, it’s impossible to ignore something that is so soft and enjoyable. While they’re admiring our craftsmanship and wondering how they can get a bean bag for their own home, your future customers will also be noticing the logos and slogans that are prominently printed on the fabric. Our personalised bean bags are a significant business investment because they’re a luxurious treat for your prospective clients, and they provide perpetual free advertising for years. From creators of fine champagne to esteemed educational facilities, we’ve helped many businesses and organisations get their names into the spotlight. Successful clients who have recently benefited from our custom printed bean bags include the following. Bean bags aren’t just comfy; they’re attractive, affordable and practical. They offer weightless support and ample sitting space that works for people of all sizes, shapes and ages. Available in a variety of trendy colours, they look great in any environment. Bean bags are also incredibly lightweight, which makes them a convenient option when you need to relocate your seating quickly or often. Our premium materials and durable construction methods ensure that they’ll provide many years of reliable service. Introducing the world to your brand through a printed bean bag is easier than you might think. There are a million ways to do it. Here are a few examples. If you’re making a presence at outdoor expos, markets, fairs, carnivals or trade shows, an airy bean bag may transform an exhausted patron into a new customer. Outdoor sporting events never seem to have enough seating, and whatever seating is available is often uncomfortable. It’s one environment where a fluffy bean bag is sure to stand out. A bean bag is a fantastic gift for any occasion, and with your corporate logo close at hand, your brand will stay on the recipient’s mind. Place a branded bean bag or two at your event, and announce that a new one will be awarded as a prize. Your participation will soar, and your prize winner will own a great product that bears your name. Large conventions and seminars always need extra seating, especially if they’re family-friendly events. Most attendees are already alert and interested in the topic at hand, so it’s a perfect opportunity to present your brand and associate it with comfort and luxury. If you’re willing to invest a small amount, another way to get your name out into your community is to seek out and sponsor local events. Keep an eye on event calendars, and focus on events that are likely to bring your target audience together. For example, if you own a day spa, look for health-related events. If you run a building or contracting company, events related to real estate or home improvement could be a great opportunity. Once you find an event that looks promising, contact the organisers, and offer to provide additional bean bag seating. If applicable, you could also bring along fliers or product samples. 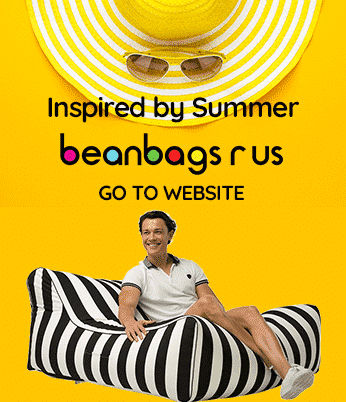 Our skilled designers at Bean Bags R Us will work with you to create the perfect seating and advertising solution. Individual new bean bags arrive flat-packed so that they’re convenient and easily gift-wrapped. For commercial orders and large quantities, we offer a filling service that includes individually wrapping each bean bag to ensure that it arrives at your event looking brand new. 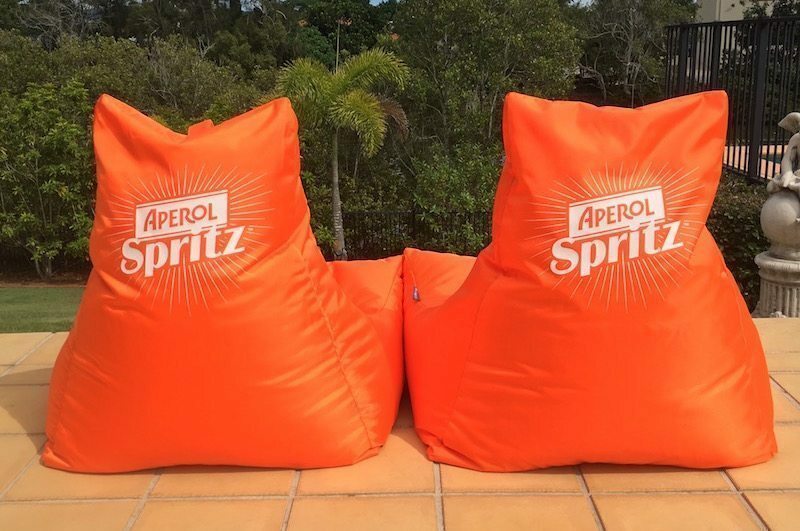 You can choose from our wide range of fashionable colours, or we can customise your bean bags to match your corporate colours or specifications. Don’t let a great branding opportunity pass you by; our bean bags will be the most pleasurable and universally appealing form of advertising that your company and your future customers could ever imagine. Contact us for more information regarding your custom order today.